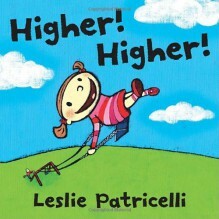 The sky’s no limit in a witty picture book about a child on a swing and the wonders of the imagination.One child. One swing. An obliging dad. The inevitable plea to go "Higher! Higher!" Add Leslie Patricelli’s wildly expressive illustrations, and an everyday pastime reaches new heights of humor and whimsy. How high can it go? Higher than a giraffe? Taller than a mountain? Is Earth the final frontier? The creator of a popular series of board books rises to the occasion with an ingenious picture book of very few words that expresses the giddy glee of being pushed in a swing.